Australian farmer Colin Seis “discovered” pasture cropping when his 2,000-acre family farm burned to the ground—outbuildings, trees, 20 miles of fencing, 3,000 sheep, and all. After three generations of work were reduced to ash, Seis found himself at a pub with a fellow farmer. They both grew grain (annuals) and grazed sheep on pastures—activities taking place on separate parts of their farms. The pastures tended to be overgrazed, and the grain acreage was plowed and disked every year, drying and decarbonizing the soil. 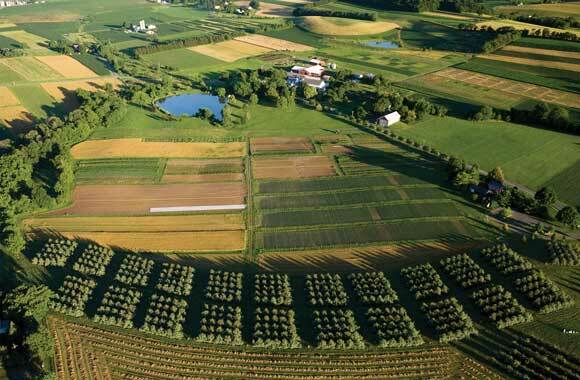 A vision emerged that night that would evolve into what is now called pasture cropping—a method of double-cropping (grains and animals) while increasing carbon sequestration. Planting annual crops in a living perennial pasture creates an ecosystem that gets healthier every year. A complex relationship between the forbs, fungi, grasses, herbs, and bacteria reknits the web of life, increasing the health, resilience, and vitality of the soil, crops, grasses, and animals. On pasture-cropped land, the soil is never broken, and fertilizers, herbicides, and pesticides are unnecessary. Pasture cropping is now practiced on more than 2,000 farms in Australia and is spreading throughout the temperate world. Farmers benefit from reaping two crops from the same land: grain, and wool or meat. Dunn, Joel. “Pasture Cropping: An Integrated Approach to Grain and Pasture Production.” Permaculture Research Institute. June 30, 2012. http://permaculturenews.org/2012/06/30/pasture-cropping-an-integrated-approach-to-grain-and-pasture-production/. Finlayson, J. D., R. A. Lawes, Tess Metcalf, M. J. Robertson, David Ferris, and M. A. Ewing. “A Bio-Economic Evaluation of the Profitability of Adopting Subtropical Grasses and Pasture-Cropping on Crop—Livestock Farms.” Agricultural Systems 106, no. 1 (2012): 102-112. Millar, G. D., and W. B. Badgery. “Pasture Cropping: A New Approach to Integrate Crop and Livestock Farming Systems.” Animal Production Science 49, no. 10 (2009): 777-787. Toensmeier, Eric. The Carbon Farming Solution. White River Junction, VT: Chelsea Green Publishing, 2016. White, Courtney. Grass, Soil, Hope: A Journey Through Carbon Country. White River Junction, VT: Chelsea Green Publishing, 2014. White, Courtney. “Pasture Cropping: A Regenerative Solution from Down Under.” The Solutions Journal 4, no. 1 (2013): 69-75. https://www.thesolutionsjournal.com/article/pasture-cropping-a-regenerative-solution-from-down-under/.